It was late January of 2004. The school year was winding down to a close. The cool winds had begun to give way to rising temperatures and humidity. The football field was starting to turn golden as the rains started to become scarcer. We were also getting ready to play in the final of the Friendship and Solidarity Cup – otherwise known as FSC – a tournament organized by the school itself for college teams in the region. Our opponent in the championship game was the University of the Philippines at Los Baños or UPLB. I actually had issues with the format of the tournament. There were just four of us teams competing for the cup in a double round league format. Apart from UPLB, there was also a team from St. Francis Major Seminary and another one from the De La Salle Health Sciences Campus. Even before the tournament started, I already voiced out my objections to the format. To my mind, the team that accumulated the most points after the six league rounds were completed ought to already be declared champion. Instead, after the two rounds were completed, there were still play-offs for third between the third and fourth placed teams and a championship match between the first and second placed teams. Because there were only four teams in the competition, the play-offs seemed – at best – rather farcical. However, because I had a team entered and I did not wish to seem as though I was trying to influence the eventual outcome of the tournament, I allowed the organizers to push through with the format after I had voiced out my concerns. We were playing for our fourth FSC title and I was really quite confident of our chances. The college team we had that year was probably even more complete than those that won the first three titles. This was the year when no less than eight players from the successful high school team of 2003 crossed over to play for the college. The central defensive partnership of Allan Navasero and Oliver Aguila was good enough to have anchored the best college teams in the country. Both were tall, skillful and composed when in possession of the ball. Andrew Calso and Valiant Almonte played on the left and right flanks as fullbacks. Midfield was where we were strongest. Ryan Avenio was leftback in high school but I asked him to play higher up the pitch for the college team. At the right wing was the tireless Tyron Anciano, once a track star and somebody who could run all day long. However, it was the midfield partnership of the supremely intelligent Deney Reyes and Rommel Valencia that gave the midfield real balance. Valencia was perfect as the holding midfielder; a tiny spitfire who won the ball for us and protected the defensive line. Reyes was the playmaker extraordinaire; somebody who always made himself available to pick the ball up from the defenders and from whom all our attacks flowed. Upfront, we had the option of partnering Mark Yanga with either Pinkerton Alamillo or the supremely gifted Eldrich de Villa. 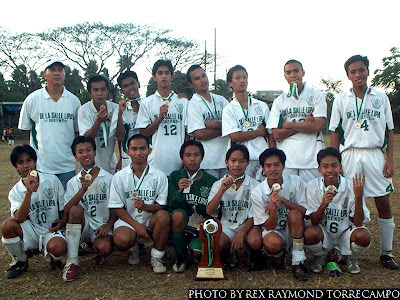 A word about de Villa: in almost three decades of LSFC football, I rank him without thinking as the most lethal striker to have ever worn the school colors. Like Reyes, he played for the powerful high school team of 1999. He had an exquisite first touch of the ball and could finish with either foot. The problem, perhaps, was that the gift was not really matched by temperament; and he always rather tended to take his talent so for granted. We breezed through both elimination rounds as expected with maximum points. All four matches against the seminarians and the team from the Health Sciences campus were little more than training games. Although UPLB had a tad more class than either of these teams, we still beat that team comfortably in both elimination round matches. This was where it got tricky. We won all our matches without really having to exert ourselves; and then all of a sudden we faced an unwanted championship match. The eighteen points we accumulated from our six wins counted for nothing in this upcoming winner-takes-all game. The championship game favored UPLB at least in psychological terms. Since we had already beaten it twice in the eliminations, it could play with the abandon of a team that had nothing to lose. The pressure was all on us! It showed in the opening exchanges. Our opponents pressed us in our own half, making it difficult to thread together the short passes that brought us so much success in the elimination rounds. Our defense, which played with so much stature in the eliminations, was suddenly unable to cope with the siege. Inside twenty minutes, we were already down 0-3. I was irritated, but only mildly so. Had UPLB scored its three goals in the second half, I would have been really worried. That would have meant game, set and match; thank you very much, it was fun while it lasted. We had played UPLB twice in the elimination round and some of its players would cramp up towards the end of both matches. I knew they would not be able to sustain their up-tempo approach – which they did not take in the eliminations – for the duration of the match. Although they had already scored three times, there was still too much of the game left and they would have to deal with the pressure of having to keep us out to hold onto their lead. Besides, I still had Eldrich de Villa – who had been skipping training – sitting beside me ready to enter the fray at the poke of my finger. Before the end of the half, a long clearing punt by leftback Andrew Calso bounced over the UPLB goalkeeper and into the goal. From that point on, all the swagger left UPLB and we started to string together our passing moves. Deney Reyes started to look more like himself and started to spray pin-point passes left, right and center. In the second half, it was time to send in de Villa. This time it was UPLB that was struggling to cope with us as we weaved our passing moves to create chance after chance to score goals. Before long, we were up 4-3, order restored, thank you kindly. We were just coasting along when, in the dying moments of regulation time, a defensive mix up allowed UPLB to grab a – by then – unexpected equalizing goal. We had to do it all over again in extra time. This was 2004, though; and FIFA had not yet scrapped its golden goal experiment. For those not into football, this simply meant that if a match ended tied after regulation time, the first team to score in extra time won the match. I was irritated that we had let in a goal so late in regulation time. Still, I did not see how we could possibly lose this. UPLB started the match brightly but had faded so badly that even their equalizing fourth goal seemed as much a surprise to them as it was to us. While we had our own players who did not train as diligently as I would have wanted them to, the core of our team were still freshmen college players who had the legs to go through extra time. So, we started extra time on the front foot as we ended regulation time; that is, attacking UPLB. Tyron Anciano raced down the right flank to deliver a cross that caused confusion in front of the UPLB goal. In the melee, from out of nowhere popped in Rommel Valencia to toe-poke the winning golden goal! The whole team raced around in delirium! It felt good, that much I can say! Even then, I could be the jaded coach who had seen it all. But that golden goal championship win, it really felt something else! Like Lazarus rising from the dead! I know I had my issues with the tournament format; but, in hindsight, I do not think I would have had as much fun had we been declared champion after the two elimination rounds were concluded.